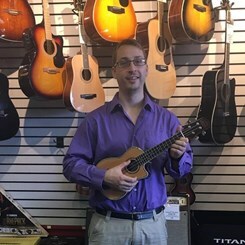 Hello my name is Robert, and I am a senior sales associate here at the Marlton Music & Arts location. I recently graduated from The University of the Arts in Philly with a B.M. in Vocal performance. I started performing in 4th grade when I joined choir and played alto saxophone in band at Muhlenberg SD in PA. I continued to grow musically joining the small group choirs, started playing tenor sax in jazz band, played a lead role in my schools musical, and I was selected to be a part of county, district, and regional chorus. I enjoy singing baritone in classical and traditional choir music, but my focus is Jazz, Rock, Soul, R & B and Pop. I play guitar and keys as well and I like to try out as many other instruments as possible. I would love to talk to you about music! Feel free to email me or come into the store with any questions!